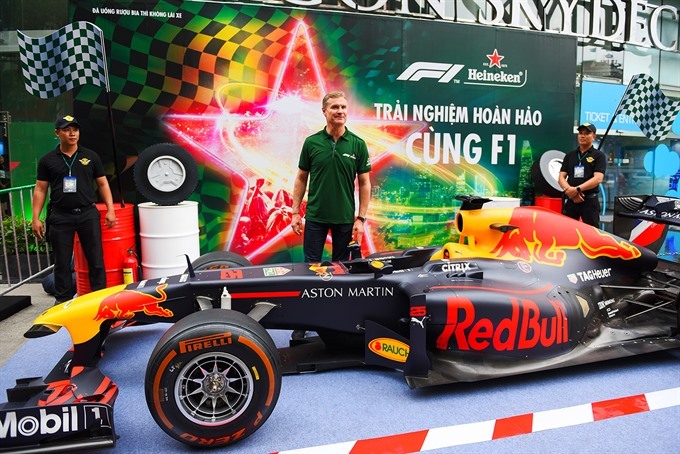 HCM CITY — The "Perfect Formula 1 Experience" event featuring a real F1 car from the Aston Martin Red Bull Racing Team, brought and sponsored by Heineken, kicked off yesterday in HCM City’s Sala Residential Area in District 2. Former driver and Heineken F1 Ambassador David Coulthard, and the world’s No 1 DJ, Martin Garrix, joined the event. For the first time ever, Heineken turned the Sala Residential Area into an extravagant 2-km long racetrack to pave the way for an epic performance from the real F1 car. “We definitely made as much noise during the day at the F1 experience as Martin Garrix and leading Vietnamese artists did later at the spectacular music event,” said David Coulthard, who has won 13 Grand Prix races, and has finished in the top 3 of the FIA F1 world championship five times, with a remarkable 62 podium finishes over 15 seasons. The event is also used as a platform to raise awareness about “When You Drive, Never Drink” in the ongoing campaign that was launched in September 2017 to bring about behavioural changes toward driving after drinking. A day before, the F1 car of Aston Martin Red Bull Racing Team, which has won four successive F1 World Constructors’ Championships - was displayed for the public at The World of Heineken at the Bitexco Financial Tower in downtown HCM City.